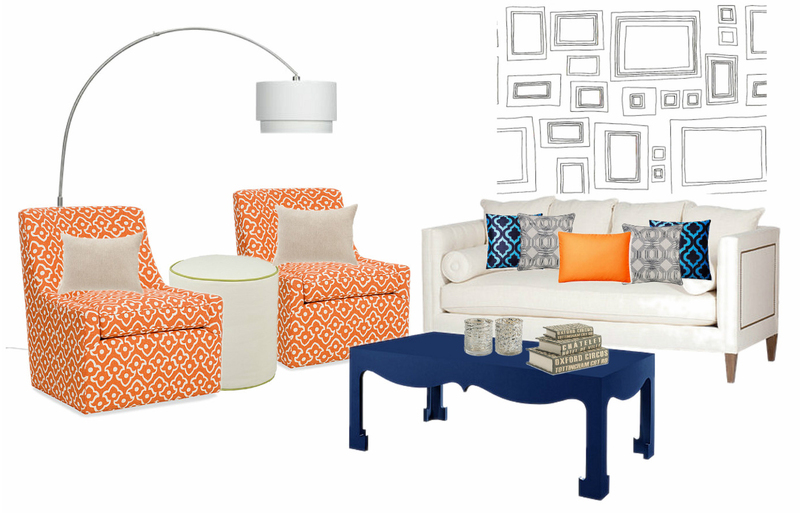 I put together an interior inspiration board for a living room using an orange, blue and off white color palette. I started off by picking the color palette I desired. The first piece I chose were the Simon chairs by Layla Grayce. I used them as a statement piece in the room. The orange pattern is very bold so I tried to stay subtle with the other furniture. When it came to choosing the pillows I didn’t shy away from using more patterns – it is possible to mix and match without looking tacky. Everything else just kind of came. This is a mid to high-end interior totalling $7,125. Most pieces are from Layla Grayce with a few low end accessories from One Kings Lane. I found this outfit on Lookbook.nu and absolutely fell in love. There’s something about wearing all white. Its daring on many different accounts. Maybe because the whole “no white after Labor Day” rule.. who knows. In this outfit she paired cropped skinnies, a white blazer and a nike tee. I’m also loving this purse – it has a paper bag kind of feel. The fur brings this outfit to a whole next level. LOVE! The photo to the right is a Scandinavian inspired interior. The primary color is white (we all know I am obsessed with a white interior) paired with black accessories and the fur throw makes this interior the perfect match for our white and black #ootd. What is your favorite element of this room? Do you have a favorite piece that she is wearing? Let me know in the comments below. Hope you enjoyed the first edition of #InspirationTuesdays. Welcome to #InspirationTuesdays. Every Tuesday I will be posting different inspirations images and boards to help get your decorative juices flowing. I will create different room boards from trendy furniture/decor pieces or based on different decorating styles. Just like nature can be used for inspiration so can fashion. And because we love fashion here at #ohmydecor, I will also be incorporating fashion into these inspiration boards! I hope you’ll enjoy this new addition to #OhMyDecor. If you have any suggestions, styles or find interior inspiration pieces you would like to see on the blog, let me know in the comment board.